With a title like Pledge, Vaseline and Vocabulary, etc., and the knowledge that she has a three-year-old boy, a very wise 8-year-old daughter, plus a 14-year-old step daughter - as in teenager - you can imagine without even reading it that you'd better go to the bathroom first. I didn't and I laughed so hard that I paid the price. After reading Ashley's eventful day, I decided she's lucky to have all this fresh material to write about. Then I remembered two things. First, I have at least fifty years of stories like that, and I can embellish them. Who will care now? The second thing? She has to clean up the vaseline and Pledge. So here are two catastrophes that occurred on Forest Road in Green Acres. Let me start this story with the kitchen floor. It's not only children who can create slippery ones, although I think Carlos wins the all-time award for the most mischief in one day and the most inventive in his choice of substances. On a day long ago, I was standing in my kitchen contemplating the probability of needing a plumber to ream out my very slow kitchen sink drain. I had taken off the trap, but by some magic I knew it was still clogged down the line. Maybe I had pushed the clog down, I don't know. Remember please, I was just standing there minding my own business when Joanne, my friend from across the street, came wandering in. I'm wondering now, "Who left that door open?" Just kidding. Joanne and I are 50-year friends. I will swear to my dying day or hers, whichever comes first, that it was her idea to use the pressure from the garden hose to force the clog through the line. I have to admit the hose was lying right there in the carport where I left it after watering a bed of flowers somewhere or other. So it was probably my fault that she so quickly thought of a hose. I know we used it, and I remember a lot of water and intermittent fountains. Beyond that my memory fades. I'm not going to refer you to Joanne because she'll just say it was my idea. I even had a pet snail for a while. I put her in a clean paper cup every day with some fresh water and a nice crisp piece of lettuce. She made slime out of that which she did and did not eat and then climbed out of her cup and made it half way up the kitchen curtain -- every day. I didn't care if she was running away. She was my pet and she was going to love me. Wonder what ever happened to that snail. She's probably still trying to get up suicide hill. They're really slow, those snails. Maybe I should have given her a name. Our vet was Ellen Maxwell. I had taken one of the animals to Ellen for some shot or other and boy did she ever see me coming. She brought out this adorable little white and black wire-haired terrier. You know the one, hair framing this sweet face, partially covering big brown eyes. He had tried to get out of a wire fence and got his leg caught. I don't know how long he was hanging there, but the owners brought him in to Ellen. They decided they didn't want a three-legged dog when Ellen told them she couldn't save the leg, so they asked her to euthanize him. Cruelty to animals takes many forms. I feel sorry for cute little dogs. They are so likely to be taken home because they're cute, even if the humans involved don't really want a dog. I know that was true in this case because about ten years later, Ellen slipped and told me who had brought Scotty in. I didn't know them or care to, but I knew this dog had been neglected before being caught on the fence. He did not know how to play! What dog that is loved doesn't know how to play? Scotty was over a year old when we got him (Of course I took him -- kept Ellen from having 13 dogs. I knew she had already rescued a dozen.) She promised vet care for life if I'd take him. She amputated the leg and made sure he was healthy before we brought him home. Scotty was always touchy about the place where his leg was removed, so we had to be very careful when we picked him up, but you should have seen him chase a motorcycle. He would tumble over sometimes because of the missing leg, and then roll onto his feet again and keep going. Oh, how he hated motorcycles. That's the only time we ever heard him bark. I'm going to tell you the last part first because it has nothing to do with the funny Scotty incident. Scotty lived to be about 22, but in all those years he never learned to play. We tried when we got him home, but all he wanted was a place to sleep near someone, a little attention, and plenty to eat, so we gave him those things. Wes's dog Heidi was in the back yard, part black lab, other parts unknown. She was fenced in, and couldn't get over the fence, but little Scotty climbed it and got out every time we put him in it. The dogs got along. Heidi was a big dog and happy to have company, but that stubborn little dog was not about to be fenced in, so we just stopped trying. He would lie in our carport, our neighbor's carport, or very close to the wooden fence. Laws about pets weren't so severe then and most people's pets stayed in the neighborhood and went home to get fed. Somewhat like the kids! I don't ever remember it being a problem, but I think breed matters. Popular breeds were labs, terriers, German shepherds, Collies, lots of small dogs, dalmatians, beagles, Boston bulls - not many rottweilers, pit bulls, or other aggressive dogs -- even docile bulldogs were rare in dawg country. Scotty developed some funny habits over the years. He could hear the school bus from several blocks away, so he would go across the street and wait for Wes to get off. Then they would run home together. That was it. No playing, just escorting Wes home. In later years when Wes was gone, Mr. Humphries retired and spent a lot of time in his yard -- planting flowers, pulling weeds. Scotty would go down to his yard and follow him around. Mr. Humphries said he stayed about ten feet away from him, never barked, never came near, just kept him company. In a way, it's a sad story, but we gave him the best life we could. My friend Marge also had a dog with only three legs. I've forgotten why. Her name was Nosy, partial lineage unknown. Sometimes, Nosy and Scotty would play together, which means they did a lot of circling around each other. Wouldn't you like to overhear their conversation if they could talk, each of them missing a leg and all? I'll bet they could tell some stories. Lots of turned heads in cars going by when they saw those two three-legged dogs together. About the time we got Scotty, Wes was approaching three, and went to Kittredge pre-school for part of every day. One day, at his request, I brought him home right after lunch. Nosy and Scotty were playing in the front yard and as I pulled into the drive, I realized that Nosy had put her jaw under Scotty's flea collar and in her attempts to get it out had twisted it around Scotty's neck. She was actually shaking Scotty trying to rid herself of this dog hanging on her jaw. I ran for some scissors and got close enough to calm Nosy. Scotty was limp by then. I cut the flea collar off and in the process cut Nosy's bottom lip and she was bleeding. Yelping, she took off for home and Scotty was very still. Picture 3-year-old Wes as background music. 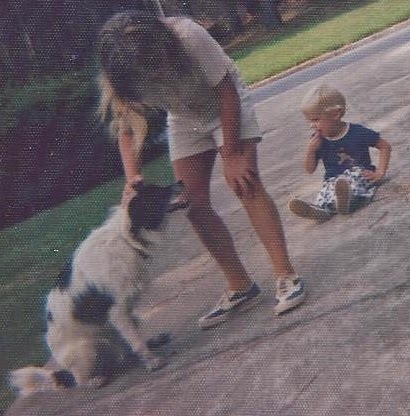 I was not coping well, trying to comfort a sobbing Wes and examine a very quiet little dog at the same time. Then Jim Dandy to the rescue, but it wasn't Jim Dandy, it was Ed who pulled in across the street, saw something was happening and came over. He gave Scotty a sort of artificial respiration by pressing on his chest. Scotty started breathing on his own fairly quickly, so we put him in my car and took him to Ellen. She pronounced him okay, so crisis averted! The story, however, was not yet ready to run the credits. Couple of wrap-up scenes needed. I called my friend Marge to tell her what had happened and why Nosy had a bloody chin. She started laughing, and I was somewhat offended. I said, "It's not funny, Marge, Scotty almost died." She said, "Chris, you had two three-legged dogs in your front yard, hooked up by a flea collar and you don't think that's funny?" Well, she was right, but I was still a little shaken. When Amy got home from school we told her what had happened and then Wayne had to be told when he got home and then we thought it was finally over - hurry-up dinner, dishes done, day over, all is well, right? By the way, the reason Ed was home at noon was because he had mononucleosis and he was supposed to come home and rest. Fat chance, with us as neighbors. Ed's wife, Dolly, and Amy both went to the same school - a teacher and a fourth grader - and when Amy went to school the next day, she told everybody that Ed had given our dog mouth-to-mouth resuscitation. That's the end of the story, I think. Oh, yes, there was one more thing. 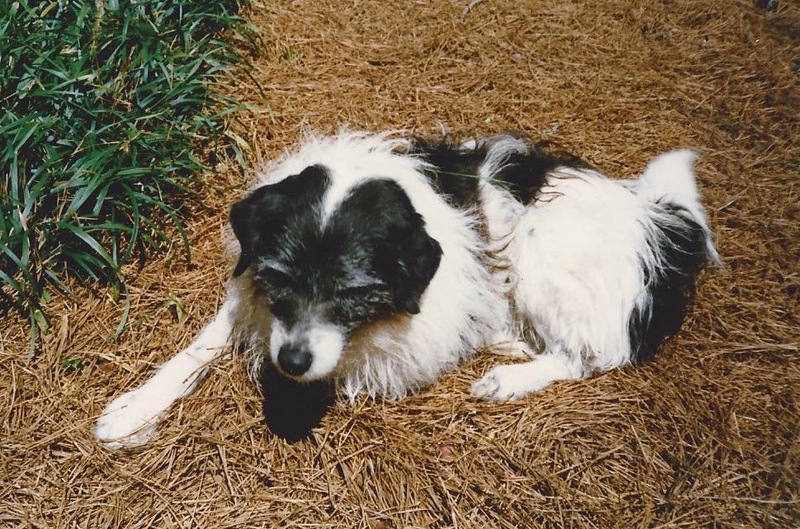 We had garage sales in the neighborhood frequently, and when people would come, they would see the three-legged dog, maybe even the one down the street, and they would ask what happened. One person even asked if it was 'catching.' Amy and Wes told a few people the whole story, even the part about Ellen not having to add another dog to her twelve. Then I think through the years they got tired of telling Scotty's story, so they would say. "I don't know. He lost the leg before we got him." And they certainly wouldn't tell the story about Nosy's and Scotty's big adventure. Waaaaay too long. In later years they laughed about cagetheir reluctance to dive into that story yet one more time. Real catastrophes? Probably not, but there are more stories. 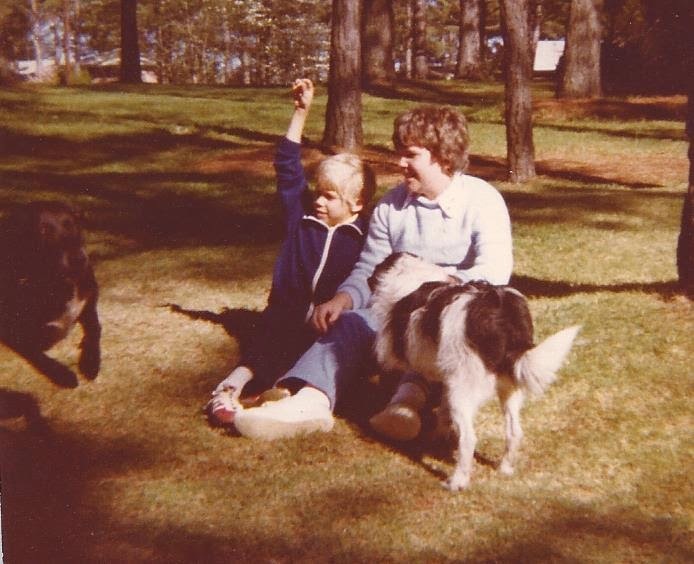 I decided a long time ago that most funny family stories center around kids, pets, or cars. Adults just aren't that funny. Well, there was the hose thing in the kitchen with JoAnne, but that wasn't really funny, just dumb. JoAnne and I got into trouble frequently and it was usually my fault. So if you see Catastrophes again as a title, you can count on it being funny or dumb, and it will probably be about kids, or pets, or cars or maybe just JoAnne.